Yamaha Motor Releases New High-Performance Compact Printer - YCP10. 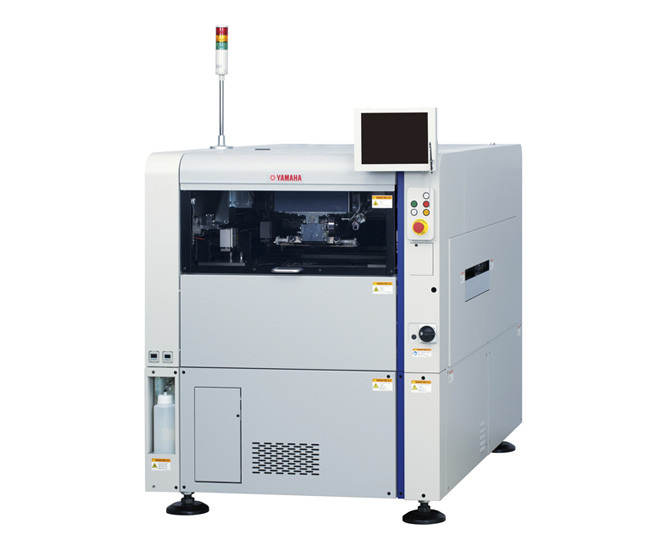 Printing quality similar to flagship models, compatible with large circuit boards and a wide variety of stencil frames - News Releases | Yamaha Motor Co., Ltd.
IWATA, April 14, 2014 - Yamaha Motor Co., Ltd. (Tokyo: 7272) is to release the YCP10, a high-accuracy, high-quality and compact solder paste*1 printer on June 1, 2014. The YCP10 is developed as the successor to the YCP II, and offers high-performance printing in a compact body that is also cost effective. It has the versatility to handle large circuit boards, as well as a wide variety of stencil sizes despite its compactness. In addition, the YCP10 provides a printing quality that is equivalent to the YSP, Yamaha Motor's high-end printer. The YCP10 comes standard with Yamaha Motor's unique 3S head*2 and stencil suction mechanism. Measures have also been taken to reduce the tact time of the printing line including the use of servo motors for parts transfer. As a result, a tact time of 13.5 seconds (normal printing at optimum conditions set by Yamaha Motor) has been achieved, an improvement of approximately 12% over the current model. The YCP10 comes standard with many user-friendly features including a graphic alignment function to allow the circuit board and printing stencil to be aligned with very little training required, and a touch panel which allows operators to control the machine as if they are using a tablet computer. To mark its release, the YCP10 will be exhibited at NEPCON China 2014 on April 23-25 in Shanghai, China, as well as at the 16th JISSO PROTEC Show to be held at the Tokyo Big Sight (Koto Ward, Tokyo) on June 4-6. Yamaha High-performance Compact Printer "YCP10"
In recent years, the electronic component mounting process is increasingly becoming about high density and high performance. Consequently, high-precision and stable solder printing that also considers the characteristics of the solder, stencil precision and the size of the circuit board is sought after, whether the printer is used for consumer or industrial purposes. The YCP10 was developed as a compact and cost-effective printer intended for the global market, featuring a printing performance that is as precise and as high quality as our high-end models. Using our advantage of offering a full lineup of surface mount equipment, including printers, dispensers, surface mounters, and inspection systems, the YCP10 is based on a high-quality design and uses the same high-rigidity frame used in the other equipment in our lineup. In addition, by being able to set up an in-line mounting system seamlessly, Yamaha Motor has achieved an improvement in production efficiency and quality for the entire mounting line. - Squeegee attack angle and speed can be set by users thanks to the use of servo motors. High filling ability and quality can be maintained by programming the head according to the solder, stencil and circuit board used. - Single squeegee halves excess solder from sticking to the head, thus saving solder paste usage. It is also easy to maintain and to carry out product changeovers. - The YCP10 has been designed to process L510 mm x W460 mm circuit boards, which in turn allows for various types of circuit boards to be processed, including assembly boards, large liquid crystal boards, and large industrial boards. - It is also made to be highly versatile as it not only is compatible with a global inch-size stencil frame (L736xW736: 29 inches), but also caters to a variety of stencil sizes including an M-size stencil frame; size changeovers can be carried out instantly. A stencil suction mechanism, which featured in some of our earliest printers, makes offset input procedures redundant during reciprocal printing. This not only reduces changeover time significantly, but also enables stable and high-precision printing without being affected by stencil deflection. The printing table and frame combines high rigidity, light weight and compactness, achieving excellent printing accuracy and plate releasing ability. The Multiple Accuracy Compensation System*1 and heat expansion correction function, as well as the stencil suction mechanism guarantee an industry-leading*2 repeatability accuracy of 5 μm [(3σ)±0.005 mm]. *1: MACS (Multiple Accuracy Compensation System): A function that improves printing accuracy by taking into account all factors affecting accuracy, such as the printing stencil, the PCB and the various factors of the machine and corrects for them in a comprehensive and multifaceted way. Reduction in damping time and motion sequence optimization through servo motor transfer achieves a printing tact time of 13.5 seconds (normal printing at optimum condition set by Yamaha Motor), an improvement of approximately 12% over the current model. Corresponding positions of circuit board and stencils are layered with the circuit board and stencil cameras. This enables the alignment of the board and stencil to be carried out more intuitively and effectively by viewing the monitor. In turn, fine-tuning of the printer positioning parameter can be carried out instantly with very little training, reducing time and effort during the changeovers. While making it easily adaptable for users of conventional models, the YCP10 comes standard with a user-friendly touch panel that is easy to operate. Japanese, English, Chinese and Korean language options are available. The YCP10 complies with CE safety design standards, enabling the equipment to be sold worldwide.